Born in 1922 AD. South Africa. 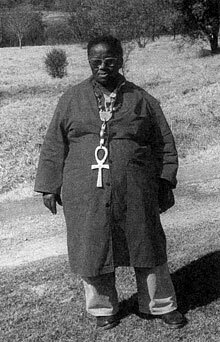 Initiated for the first time in 1937 AD into the mysteries and knowledge of Mother Africa. Great Zulu Shaman and Elder. Keeper of Traditions. "The people of Rwanda, the Hutu people, as well as the Watusi people, state, and they are not the only people in Africa who state this, that their very oldest ancestors were a race of beings whom they called the Imanujela, which means �the Lords who have come�. And some tribes in West Africa, such as a Bambara people, also say the same thing. They say that they came from the sky, many, many generations ago, a race of highly advanced and fearsome creatures which looked like men, and they call them Zishwezi. The word Zishwezi means the dival or the glidal-creatures that can glide down from the sky or glide through water"
"..gods came out of the sky and made us into their slaves, and they made us into slaves in such a way that we would never realize that we are slaves." "People are basically good; I believe this. People don�t want to start wars. People don�t want to destroy the world in which they stay, but there are creatures, or there is power that is driving we human beings toward self-annihilation. And the sooner we recognize this, the better."